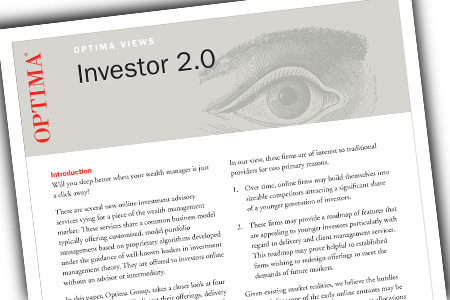 Investor 2.0 | Optima Group, Inc.
Optima Group’s recent white paper, Investor 2.0 , is now available. It presents an overview of the new wave of online investment advisory firms as well as the evolution in demand for this new delivery model. 1. Over time, online firms may build themselves into sizeable competitors attracting a significant share of a younger generation of investors. 2. These firms may provide a roadmap of wealth management features that are appealing to younger investors particularly with regard to delivery and client management services. This roadmap may prove helpful to established firms wishing to redesign offerings to meet the demands of future markets.